A resident of Aleppo in the midst of buildings damaged by an airstrike from President Basher al-Assad’s forces. Credit: Zak Brophy/IPS. ALEPPO, Syria, Sep 23 2012 (IPS) - Two floors have been ripped from the top of an apartment block in Aleppo in northern Syria. 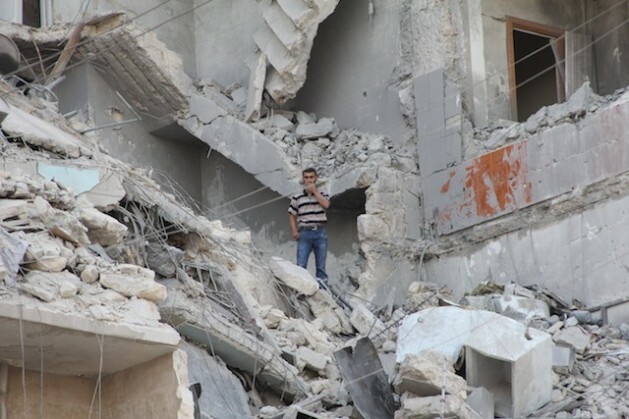 A lone man stands amidst the rubble four stories up after a missile from one of his own government’s fighter jets smashed into the building that morning. With his arms crossed, the solitary figure surveys the destruction around him. The battle for the control of Aleppo between the Free Syrian Army, or FSA, and the forces of President Basher al-Assad’s regime erupted in earnest just over two months ago, and the opposition now control almost two-thirds of the city. While the government’s forces have been unable to wrest back control, amounting to a serious blow to morale, they have unleashed a relentless campaign of aerial bombardment from planes, helicopters and artillery to try and crush the rebel uprising. That the battleground is a densely populated city means the homes, factories, schools and hospitals of ordinary citizens are also getting destroyed; no one knows how many hundreds have been killed. More than 200,000 have fled. It may be true that the Assad regime’s own bombs have crushed whatever legitimacy it had in these quarters, but the FSA is also often viewed as an unwelcome intruder. “People are starting to blame us. There is great pressure on us to finish this quickly,” says Abdul Fader, an Islamic scholar from Aleppo and brigade leader of around 150 FSA fighters. In the neighbouring district Sharaiyeh a whole block has been laid to waste by air strikes, and is unnervingly quiet. A truck is buried under rubble, a fallen electricity pylon dissects the street, and the incessant sound of water falling from a burst tank on a roof cuts through the silence. “I came here this morning to find this. There is nothing more I can say,” snaps a trader as he shovels up lentils from the floor of his destroyed store. He has no words, and spares no attention for the two armed FSA men standing nearby. “Undoubtedly most people welcome and support us but it is true many don’t want us here,” says FSA fighter Khalil. “They just want to eat, drink and sleep. They don’t understand the battle we are fighting against this dictatorship.” Like many of the combatants, perhaps even most, Khalil is from outside of Aleppo, and is frustrated by the mixed reception he gets. The fight for the city that used to be the trade and manufacturing workhorse of the Syrian economy has its roots in months of battles throughout the country to the north. FSA fighters have taken control of the region all the way from the Turkish border to Aleppo’s fringes; village by village and town by town. Support for the fighters in these impoverished and almost exclusively Sunni Muslim areas is much more conspicuous. Many of the fighters hail from the region’s villages. However, that endorsement has been harder to secure as the fighters descended into the more urbane, prosperous and multi-confessional city. The title FSA implies that there is a unified military force in the city, but the reality is far more chaotic. While the coordination of more localised fighting units was successful in the campaigns throughout the countryside, the fragmentation within the city is not only undermining the FSA’s ability to fight the regime but is also adding to an atmosphere of lawlessness and disorder. At a base for around 200 FSA fighters, the brigade’s leader receives some residents from an adjacent neighbourhood. “A young man, one of our relatives, has been arrested or perhaps even kidnapped at a checkpoint. We believe it was controlled by your men,” they plead. The leader wishes them the best of luck but apologises and has to concede that the checkpoint they are referring to is in an area not under his control. The men leave with a handshake but their frustration, perhaps even contempt, is palpable. Kidnapping, extortion and looting by thugs and criminals among the ranks of the armed opposition draws scorn from other FSA fighters, but amidst the turmoil in which Aleppo is engulfed there is little they can do. “There are some that commit these crimes, we try to arrest and detain them but this is a revolution and there is chaos,” says Abu Fares, media coordinator with the FSA. The FSA in Aleppo is trying to build a more unified leadership and command structure, most notably by uniting the largest fighting forces including the Union military Council, the al-Tawheed brigade, al-Fateh brigade and Soqour Shahbaa brigade under The Revolutionary Military Council. On the ground, however, there are still dispersed rag tag elements to the fighting force. “The problem is that many of the fighters come from different provinces and don’t know each other. If we could achieve even 50 percent unity then I will be very happy,” says FSA brigade leader Abdul Fader. Then there is the patently sectarian and Islamist leanings of some of the forces. A police car passing the hospital flying a large al-Qaeda flag and blaring out loud recitations of the Quran curries favour with some but not with many. Even among the Syrian FSA fighters the presence on the front lines of small groups of battle-hardened mujahedeen from countries such as Libya is a divisive reality. The terror raining down from the Syrian air force on most of Aleppo may unify the people in their loathing for the Assad regime, but it does not necessarily unite them in support of the FSA. The longer the battle in Aleppo is drawn out the more problems the FSA will have ensuring the support of the local population under their control. As the death toll mounts, the war economy ossifies and the hoodlums establish a foothold in the city, the legitimacy of the fighters will be further diminished.